There are tons of sites out there for freelancers who are looking for work, for example, SoundBetter.com, Upwork.com, Fiverr.com, etc. These sites allows you to create a profile to showcase your talent and for what position people can hire you for, for example, mixing or mastering engineer. These sites also operate on a sort of rating system, where the person who has had a lot of work with good results and good testimonials will show up at the top of the search results, obviously, resulting in more work for them. So, if you are thinking about creating a profile on one of these sites, is it actually worth spending time on creating a profile, hunting for projects, filling in forms, writing a bio, pitching yourself to clients, etc? Or, can you spend your time more effectively? If you live in a remote town, with no artist around you whatsoever, maybe creating a profile on one of these sites is tempting. Because, at least, it feels like you are putting yourself and your skills in front of people which you can’t do in real life, so to speak. Will it give you work or is it a waste of time? This is what some people had to say online. Some interesting opinions and insights here. Some people have a good experience using these services, however, it takes a few years before it starts to amount to a good income. But, as you know, this is what it takes outside of these platforms too. It takes years to build relationships and connections within the industry and the same is true for these platforms. “So far it has been very pleasant. I have completed more than 130 jobs and it was mostly with great people. I only had an issue 3-5 times when I didn't receive payment in time (or when a 50-50 payment was done and I didn't receive the 2nd half). I have mixed songs for bands that are doing really well, such as The King Lot, Psycho Skull, 777, Krzikopa and others, coming to more than 500.000 YouTube views and streams. I have worked and experienced more genres and cultures that I can count or remember. The guys at SoundBetter are also amazing, they are super helpful and take on feedback really well. Of course, not every client is perfect, many times you have to deal with them more like their therapist than their engineer. But that's just the music business for you. 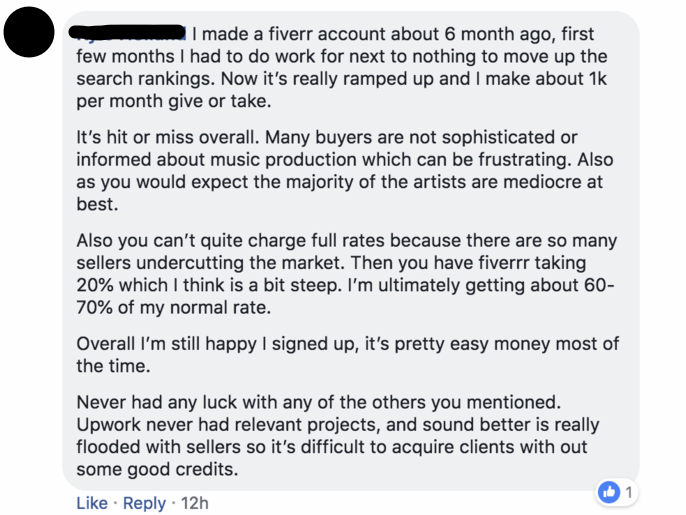 If I can put my own two cents into this, I tried Upwork.com a few years ago and it didn’t result in any work. I spend many hours looking and pitching on projects, but with no results. Some were close, but in the end, no cigar. Should I have tried SoundBetter and giving it a proper chance? Would it have been more beneficial and productive to try to connect with people in the industry and invite them out for a coffee? Even if you live in a small, remote, town, as I mentioned in last weeks article (click here), which was also echoed by Herb Trawick from Pensado’s Place, that is, travel to a bigger town and set up meetings with people in the industry. 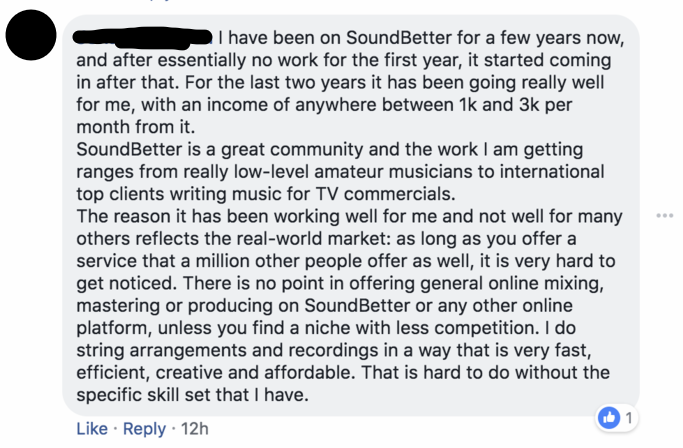 Having said that, and taking into account other peoples experiences on, for example, SoundBetter, there’s definitely money to be made there. Reading other peoples experience the tactic you need to employ is the same as in “real life”, that is, you have to play the long game, success doesn’t come faster online than it does offline. I think it can be worth trying but, and as the saying goes, don’t put all your eggs in one basket. Now, I’d love to hear your experience on this. Have you had any success, even failures, with any of these kinds of sites? Newer PostWhen Should You Start A Website?